She is one of Britain's finest actresses. 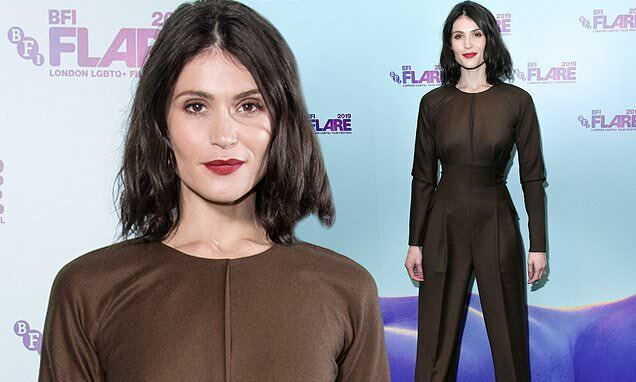 And Gemma Arterton looked absolutely flawless as she stepped out for the UK premiere of Vita & Virginia at the 33rd BFI FLARE Film Festival at BFI Southbank, London on Thursday. The star, 33, showed off her style credentials in a figure-flattering chocolate brown jumpsuit as she arrived on the red carpet. All focus was on Gemma in the sensational one-piece which showed off her figure to perfection. The jumpsuit put focus on her tiny waist and structured sleeves, and she added to the look with a pair of metallic gold high heels. Gemma enhanced her porcelain features with a dewy complexion, complete with striking scarlet lipstick. Her glossy brunette looks were tousled to perfection and fell effortlessly upon her shoulders. Vita and Virginia centres on the romantic affair between Virginia Woolf, played by Elizabeth Elizabeth Debicki, and socialite Vita Sackville-West, played by Gemma, in the 1920s.